The U.S. Supreme Court on Oct. 11 rejected the fourth effort in 30 years by Philadelphia prosecutors to execute innocent death-row political prisoner, award-winning journalist, and murder frame-up victim Mumia Abu-Jamal. In refusing to hear an appeal by the Philadelphia District Attorney’s office, the High Court essentially affirmed that the sentencing instructions given to the jury at Mumia’s 1982 trial, presided over by “hanging judge” Albert Sabo, violated the U.S. Constitution and its own decisions rendered in the 1988 case of Mills v. Maryland. In essence, the Court upheld the same rulings twice decided by the U.S. Court of Appeals for the Third Circuit and once by the Federal District Court. In all of these matters, prosecutors sought to substantiate Judge Sabo’s flawed and contorted instructions to the jury, in which he stated that they had to be unanimous with regard to each and every mitigating circumstance in order to consider any that would be sufficient to overcome the imposition of the death penalty. The Supreme Court’s 1988 Mills decision had held that a jury could discuss any mitigating circumstance as being sufficient to negate the death penalty, even if only a single juror had raised it for consideration. Mumia was represented in the proceedings by the NAACP Legal Defense and Educational Fund and by professor and attorney Judith Ritter of Widener Law School. While the decision ends the immediate threat of execution, the door is still open for Mumia’s murder. But to pursue the death penalty for the fifth time, the state of Pennsylvania must now conduct a new sentencing hearing with a new jury that is limited to determining whether to impose a sentence of life in prison without possibility of parole or execution by lethal injection. Philadelphia District Attorney Seth Williams and the Fraternal Order of Police, despite massive evidence to the contrary, continue to insist that Mumia shot Police Officer Daniel Faulkner on Dec. 9, 1981. As we go to press, however, it appears that Philadelphia and state officials, and the slain police officer’s widow, Maureen Faulkner, are not prone to continue their efforts to execute Mumia. But this is less due to any deference to Mumia’s innocence than it is to their well-merited fear that the sentencing hearing allows for the introduction of massive evidence of innocence originally barred from consideration by Judge Sabo. Should a new sentencing jury be selected, it would technically be barred from reversing the original jury’s 1982 guilty verdict. But the presentation of evidence of innocence previously barred might be of such magnitude as to compel a new judge to revisit the case and consider a new trial. Similarly, an incensed jury, in addition to rejecting a prosecution demand for Mumia’s execution, might itself, and contrary to its limited mission, indicate its contempt for the original verdict and thus open the door even wider to a new trial. Prosecutors now have 180 days from Oct. 11 to decide whether to pursue this new sentencing hearing—and risk potential damage to the legal system’s very credibility—or whether to let the matter of execution drop and accept a sentence of life imprisonment. Philadelphia’s and Pennsylvania’s hate-filled officials are likely to avoid making a final decision until the 180-period is exhausted, thus keeping Mumia in the tiny death-row cell in which he has been barred from any human contact for 30 years. After this final insult, Mumia must be returned to the general prison population, thus ending his cruel and racist isolation. Meanwhile, Mumia’s struggle for freedom is far from ended. His attorney’s have announced the hiring of a professional investigator to assemble a team to search for new evidence sufficient to demand a new trial. To meet the legal standard for such a trial the new evidence must be “compelling and not previously litigated,” as well as evidence that could not have been “previously discovered through due diligence.” Mumia’s legal team is highly motivated to meet these difficult standards. If they are successful they will file for yet another Post Conviction Relief Act hearing to resume the struggle for Mumia’s freedom. Finally, an ongoing legal effort remains in progress and is currently pending before Pennsylvania courts. This concerns the facts revealed in a report of the National Academy of Sciences that the state’s original ballistics evidence submitted at Mumia’s 1982 trial was fundamentally flawed—if not falsified by police officials. If the courts agree, the possibility remains that this might be considered sufficient to re-open the case, assuming that the same racist criminal “justice” system that has ruled against Mumia on spurious grounds for decades has a change of heart—an unlikely variant. Yet, Mumia’s supporters in the U.S. and across the globe remain dedicated to his freedom and fully understand that the continuing legal battle must be supplemented by the continued building of broad, national, and ongoing mass mobilizations and political battles demanding Mumia’s freedom. A coalition of several longstanding Mumia solidarity groups, initiated by the International Concerned Family and Friends of Mumia Abu-Jamal, is planning a mass rally in his defense on Friday, Dec. 9, marking the 30th anniversary of his incarceration. The event will take place in Philadelphia’s National Constitution Center at 7:30 p.m. Featured speakers include Cornell West, Ramona Africa, Arundhati Roy, and Michelle Alexander (via video), Mark Lamont Hill, Pam Africa, Immortal Technique, Vijay Prashad, Amina Baraka, Christina Swarns (Mumia co-counsel), and Martina Correia (sister of Troy Davis). Contact freemumia.com for further information. A solidarity rally in San Francisco with Ramona Africa and others, sponsored by the Mobilization to Free Mumia Abu-Jamal, is set for Sunday, 2 p.m., Dec. 11, at 518 Valencia Street, (510) 268-9429. Free Mumia Abu-Jamal! End the Racist Death Penalty! 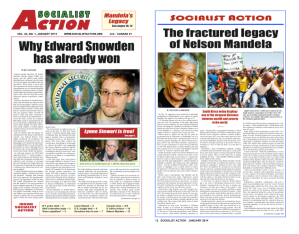 > The article above was written by Jeff Mackler, and first appeared in the November 2011 print edition of Socialist Action newspaper.